Lutheran theologian; born at Berlin Oct. 15, 1809; died at Rostock Aug. 29, 1882. He was the son of a wealthy Jewish banker, a friend of Mendelssohn. Converted to Christianity in 1829, he studied philosophy and theology at Berlin and Leipsic (Ph.D. 1831), and became successively a teacher at a private school in Dresden and at the Joachimsthal'sche Gymnasium at Berlin (1833). In 1837 he received his diploma as Lutheran minister, and in 1838 was admitted as privat-docent to the theological faculty of the University of Berlin. In 1841 he was elected professor of theology at the University of Dorpat; he received the degree of D.D. "honoris causa" from the University of Erlangen in 1843. 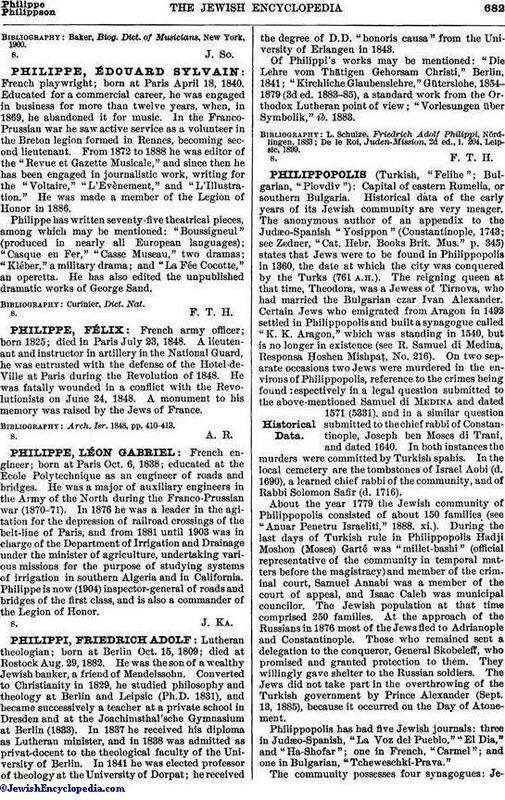 Of Philippi's works may be mentioned: "Die Lehre vom Thätigen Gehorsam Christi," Berlin, 1841; "Kirchliche Glaubenslehre," Güterslohe, 1854-1879 (3d ed. 1883-85), a standard work from the Orthodox Lutheran point of view; "Vorlesungen über Symbolik," ib. 1883. De le Roi, Juden-Mission, 2d ed., i. 204, Leipsic, 1899.